Latin for 'long feet', possibly meaning long stalks. 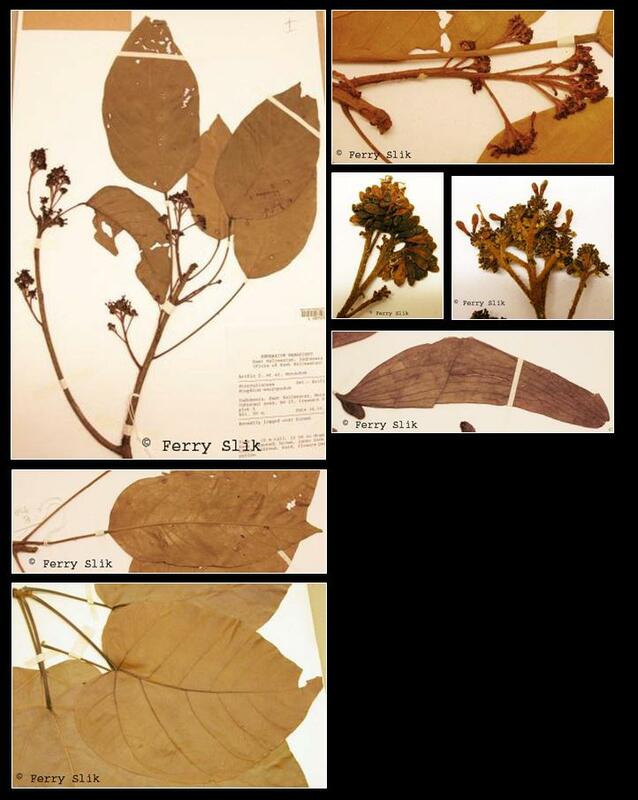 Sterculia macropoda (Miq.) Hook. ex Kloppenb. Upper canopy tree up to 41 m tall and 87 cm dbh. Leaves alternate, simple, tripli-veined, usually glabrous, leaf base sometimes cordate. Young trees with palmately-lobed leaves, number of leaf lobes is reduced when tree ages (adult trees with unlobed leaves). Flowers ca. 5 mm diameter, white-yellow, placed in panicles. Fruits ca. 207 mm long, green-yellow-brown, winged nuts (nut ca. 22 mm long), wings boat-shaped. In undisturbed mixed dipterocarp, (peat)-swamp and sub-montane forests up to 1200 m altitude. Usually on hillsides and ridges. In secondary forests usually present as a pre-disturbance remnant. The wood is used for furniture. The seeds are used to treat diarrhea, dysentery and asthmatic complaints. Cambodia, Thailand, Peninsular Malaysia, Sumatra and Borneo (throughout the island). Borneo: Berempayang, Kambang sulih, Kembang semangkok, Payang karang.